Real eyes realize real lies. Anyone who tells you that eye cream is redundantly unnecessary has either never had a facial expression or is — simply put — completely wrong. Eye care should be an essential component of everyone’s skincare routine. The skin around the eyes is not only thinner and more sensitive than the skin on the rest of the face, but suffers the most damage from just about everything we expose ourselves too. Factors include anything as harmful as UV rays to something as innocuous as a giggle. All these factors speed up the extrinsic aging while the regeneration of the skin’s own protector collagen slows down, leaving the skin weaker and more susceptible to damage. As a consequence, the area around our eyes is the most likely to show signs of aging. Here’s a warning best told by a British grandparent: Don’t pull that face because if the wind changes, you’ll stay like that. And, annoyingly, if wind changing is synonymous with time moving forward, there is some truth to this. Obviously, there are some things you can avoid. For instance — don’t squint at the sun all summer long or you’ll be left imprinted with fine lines (think crow’s feet) that become deeper as aging process takes place. But on a daily basis, it would be near impossible, not to mention miserable to live your life expression-free. You can’t help it if you side-eye your bestie when she tells you she forgot her natural SPF. Or if you, like us, laugh uncontrollably at the most glorious face-swap ever. And what would get you out of bed on a Monday morning if not for fawning over ridiculously adorable kittens photos? But, if you don’t pay enough attention to the eye-area by giving it the love it needs, expression lines will start to form from as early as your twenties (dun-dun-dunn). Dark circles under the eyes or puffiness can be the result of allergies — food, pollen, dust, pets, etc. Especially as people tend to rub their itchy eyes. However, for some people, dark circles are purely genetic. They tend to be more noticeable in people with fair skin or deep-set eyes. In both cases, it’s not really something we can proactively avoid. However, appropriate eye care can upkeep elasticity and plump up the under-eye skin. As we age, skin and the fat pads under our eyes become thinner and blood vessels become more visible, which gives the appearance of under-eye bags. On top of this, the loss of the skin’s elasticity causes the eyelids to start sagging. Under-eye puffiness caused by sagging can be improved by decreasing sodium intake and drinking more water. However, it is also important to use a rich eye treatment to help tighten the skin and reduce the sagging. So, now that we are all suitably concerned. How do we know which eye treatment is best for us? Eye crèmes are designed to hydrate, soothe and moisturize expression lines around the eye area. If you’re proactive about your eye care and aiming to prevent the effects of aging, you may be better suited for an eye crème. Luster Eye Crème is a powerful anti-dehydrating shield that preserves the maximum level of hydration. It is fast-absorbing and combines the regenerative properties of collagen and elastin and the calming and soothing effect from herbal extracts such as Chamomile and Aloe Vera. Formulated with Vitamin E and Pro Vitamin B-5, this beautifully sheer crème works to reinforce the skin’s elasticity and help to improve its overall appearance. Eye serums are lighter in consistency and penetrate deeper into the skin. 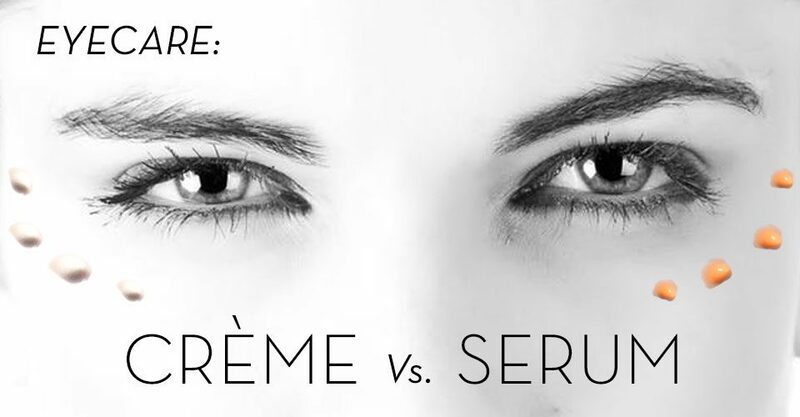 If you’re playing catch up and looking for a more potent formulation, you may prefer an eye serum. R&R Peptide Packed Eye Serum is an ultra-rich intensive eye serum packed with peptides and nutrients to reduce dark circles, puffiness and sagging. A refine and revive firming treatment for those who are seeking to visibly diminish lines and wrinkles. It contains Argireline (Acetyl Hexapeptide-8) — a muscle relaxant peptide producing a Botox like effect and Cucumber to reduce puffiness, hydrate and calm the skin.